When I’m not sewing, designing, or cooking I’m in the garden. This year I was inspired by the victory gardens of the 1940s to try and grow a significant percentage of our veggies. I started with lettuce. E loves lettuce. A lot. So I grew about 6 rows of lettuce. I planted them at different times so that I didn’t have 10 tons of lettuce all ready for picking at the same time. I have yet to buy a bag of lettuce at the grocery store. 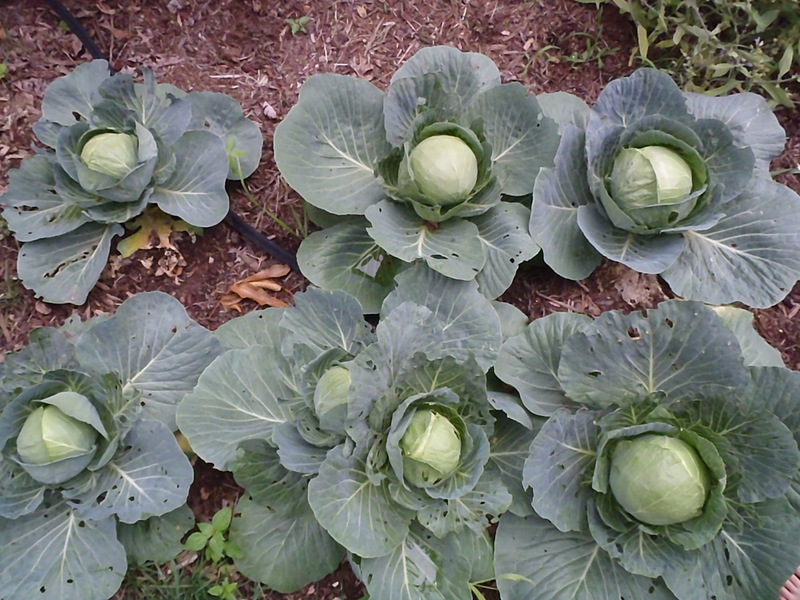 I also decided to grow cabbages this year. We found out that E really likes raw cabbage during one of our trips to a Mexican restaurant. They served his quesadia with shreds of raw cabbage and he ate his and mine. 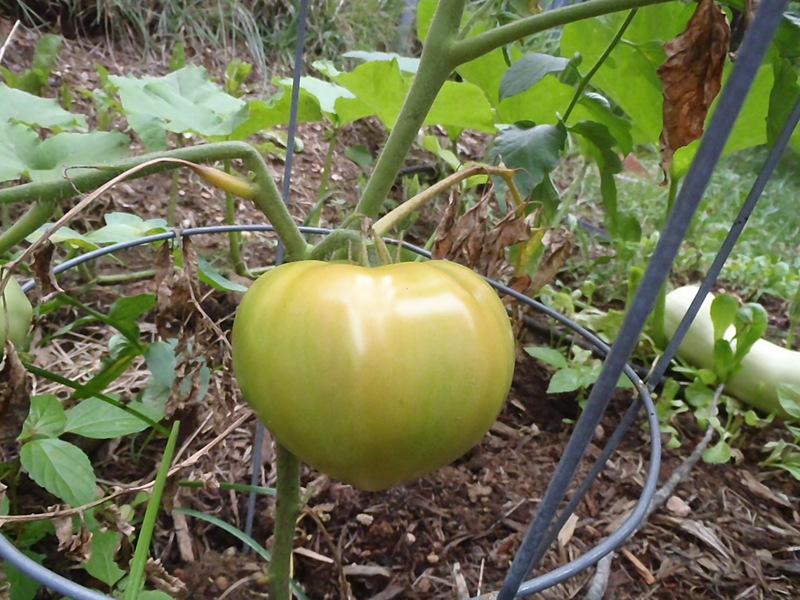 And I grabbed up some nice heirloom tomato plants and I can’t wait to see what colors and sizes and flavors I get. 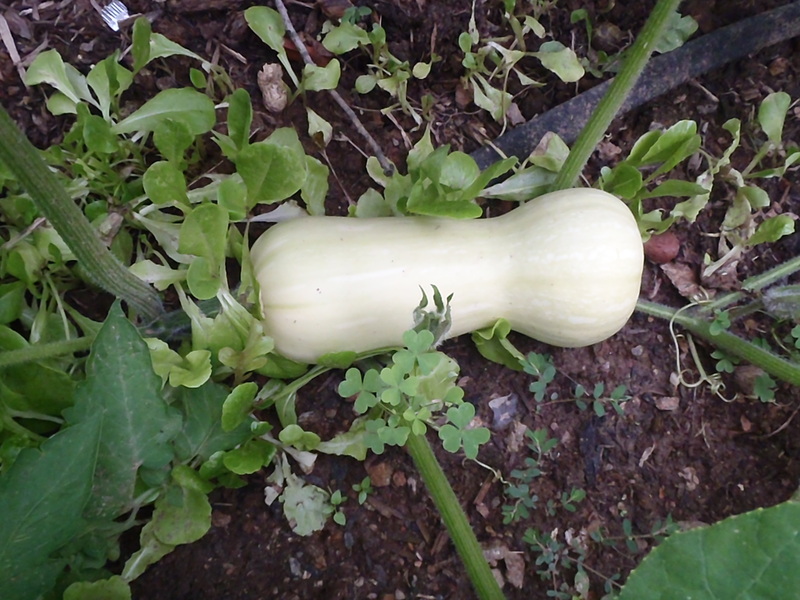 I also found a butternut squash plant volunteering itself in my compost pile so I thought I’d put it in the garden as see what happens. I’ve never been very successful with squash. The plant either bakes to death or I don’t get any squash that are larger than 2 inches long. I think this one might be doing okay. What do you think? 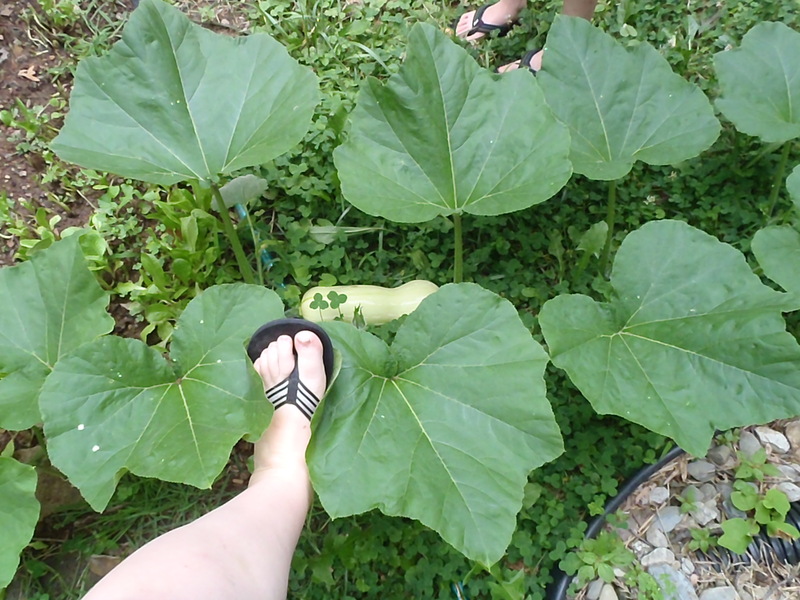 The Squash Plant that Ate my Backyard! The leaves are longer than my size 8 foot. Yes, E is standing at the end of the squash plant. I measured. It’s over 20 feet long and still growing. It may even be able to talk one day. (“Feed me, Seymore!”) But I’ve got some good looking squash on it. And, in a pinch, the leaves can be used as dinner plates. A very nice squash. Probably 2 pounds so far. And yes, the squash has conquered the lettuce rows. But you can see that the lettuce is tenacious and is growing around the squash. I’ll be harvesting the last of the lettuce soon. 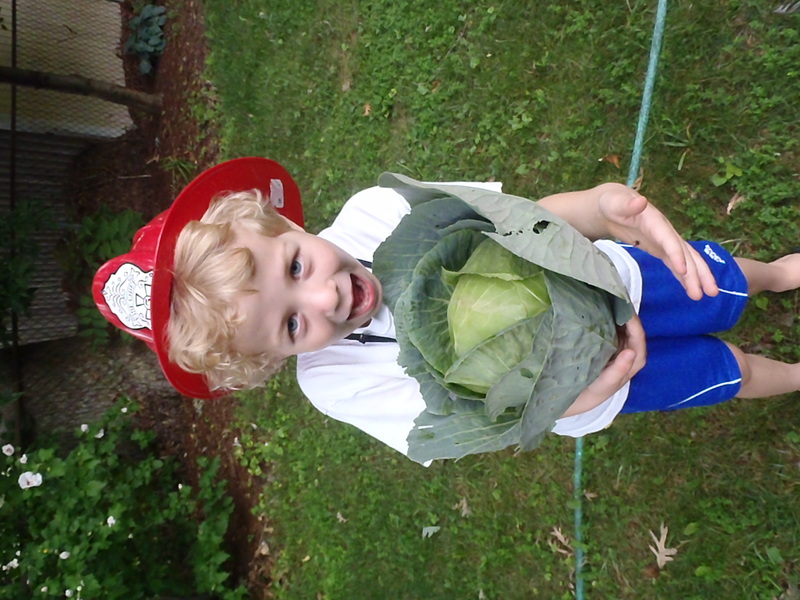 And we just harvested a cabbage! "Can I have a bite? Please?" Now I need a great coleslaw recipe. I’m also growing some watermelon in another patch, it’s just starting to flower so I’m excited about that. I have two plants, actually. One that will grow your standard huge watermelon and the other will grow a smaller, much more transportable watermelon. And then there are some beets. Just a short row. I’m going to pickle them when they are reading in the fall. And then there are the peas. I have a rectangular container that I put the peas in. No sign of a pea pod yet, but I’m hopeful! 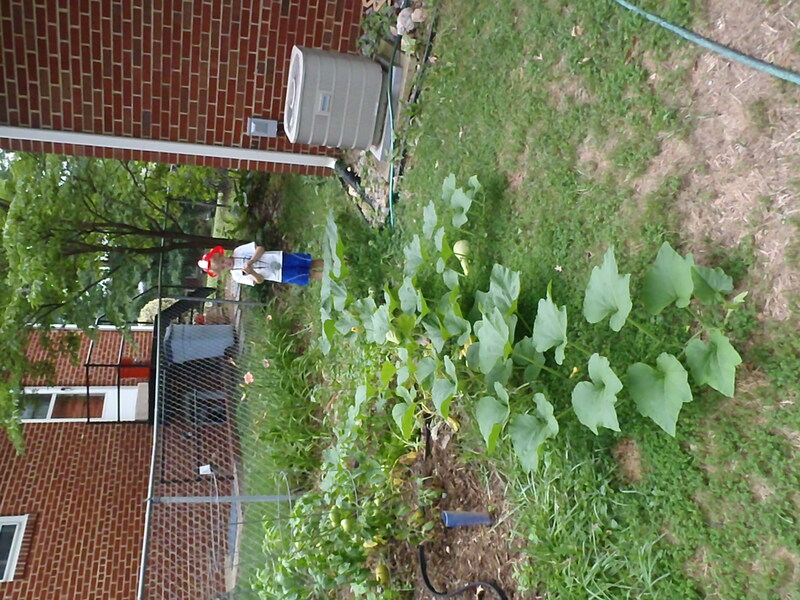 The best part of the garden is that E is loving it! He’s out there with me and very into picking and eating the veggies. Soon H will be able to help a lot more. Hopefully. He still can’t tell the weeds from the good plants, but he’s VERY into watering. And I’m also contemplating what to put in when the cabbages are harvested. Suggestions are welcome. Maybe more peas? My goodness…it looks like you have a very heathy victory garden. 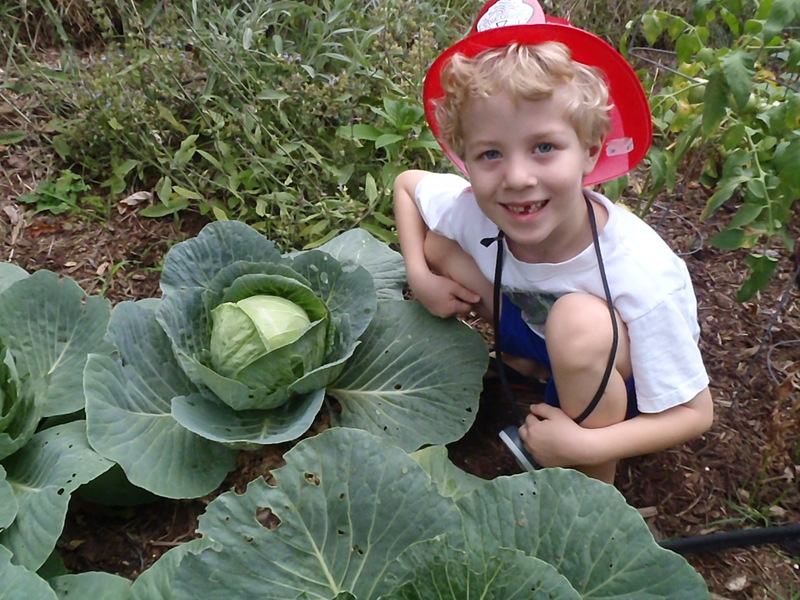 Your child will probably grow to be a great gardener and be a lover of vegetables. How wonderful. I want to know how you plan on teaching the beets to read. 🙂 The cabbage is beautiful. You will have to bring some east coast produce back to the midwest when you come. @Michelle – LOL! That’s why I leave spelling to the experts. We’ll see if we can’t get a cabbage to the midwest. And maybe some tomatoes!